A side-by-side comparison of California's Two Most Popular Rivers! 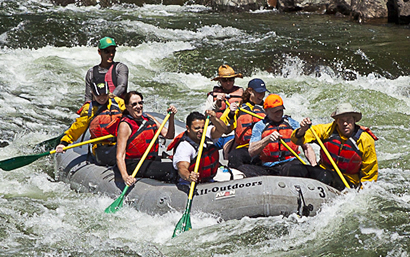 The South & Middle Forks of the American River are the two most popular destinations for white water rafting in California. Their close proximity to the San Francisco Bay Area, Sacramento and Lake Tahoe areas provide quick day trips and overnight escapes for adventurous participants of all ages. 40 miles east of Sacramento near Placerville off Hwy 49. The South Fork of the American River has something for everyone. It is the most popular introductory whitewater river in the western United States, yet it also satisfies experienced rafters, offering the diversity of classic Sierra foothill scenery, narrow rocky gorges, peaceful calms, and over 50 Class II & III rapids! The river is divided into two sections: the Upper (Chili Bar Run) and the Lower (Gorge Run), providing All-Outdoors guests with an exclusive variety of trip options. Whatever experience you desire, there is an All-Outdoors South Fork trip for you! 50 miles east of Sacramento off I-80 near Auburn. The Middle Fork of the American River is perfect for the experienced rafter or for the more adventurous first timer! Participants should be in good physical condition and reasonably athletic. It is a true wilderness river...dazzling, clear water flowing through a backdrop of green, densely forested canyon walls, rising 2000' overhead. Side streams form natural pools and waterfalls to play in and enjoy. Spectacular scenery combines with numerous Class III and Class IV rapids in this secluded canyon to create a California river experience that is hard to match. 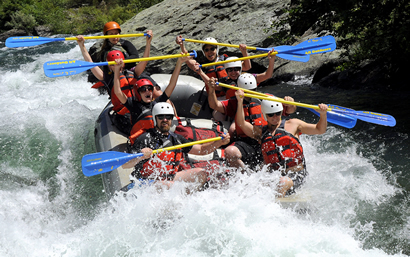 If you need help deciding which American River Rafting trip is most appropriate for you or your group, don't hesitate to contact us at (800) 247-2387.